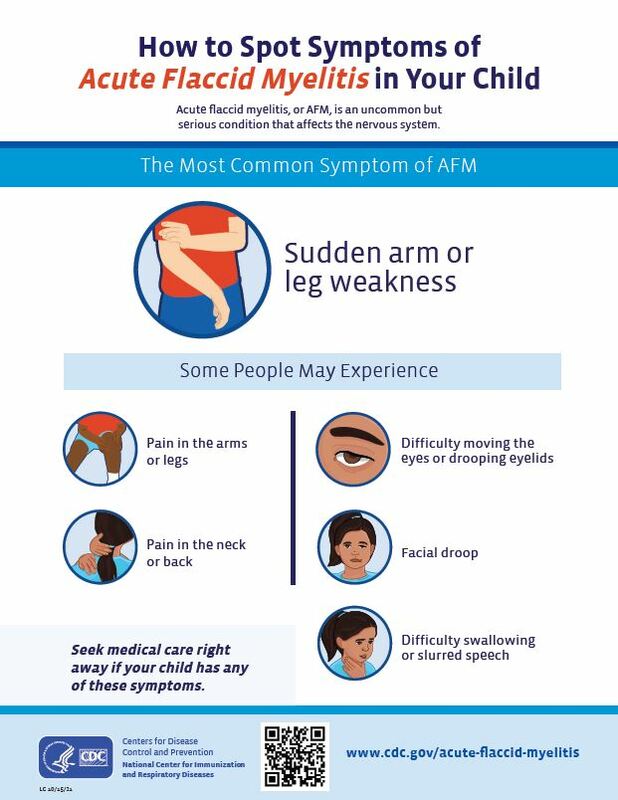 The number of US children with acute flaccid myelitis (AFM) continues to grow, and federal health officials still do not know what's triggering the polio-like paralysis characterized by sudden weakness or loss of muscle tone in the arms or legs. As of November 13, there are a total of 90 confirmed cases of AFM across 27 states, according to the US Centers for Disease Control and Prevention (CDC). These 90 confirmed cases are among the total of 252 reports that CDC has received of patients under investigation for AFM. The 90 confirmed cases reported today are up from 80 confirmed cases (among a total of 219 under investigation) across 25 states CDC reported 1 week earlier, on November 5. The CDC has now asked US health departments to cross-reference their list of AFM cases (from this year and prior years) against their death registries to identify any deaths that may have been the result of AFM. 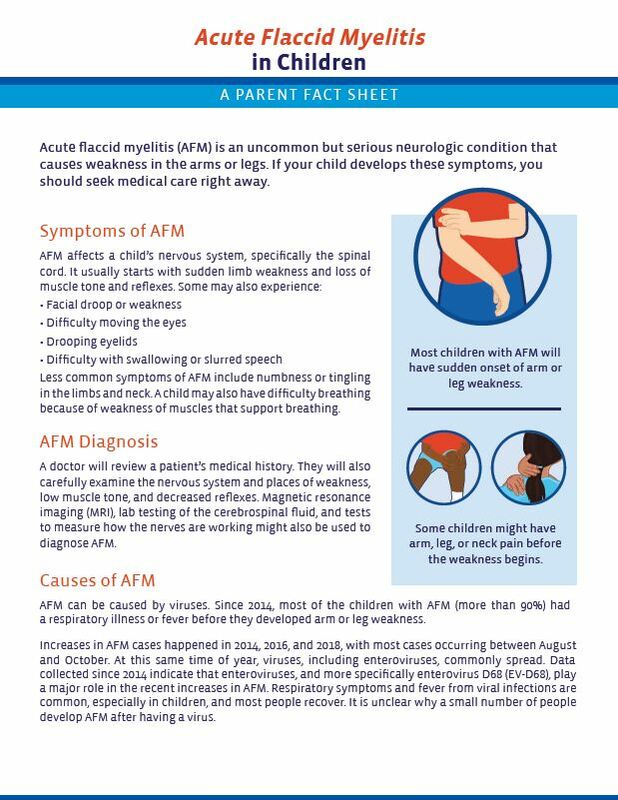 Most AFM cases involve children between 2 and 8 years old and about half are male. Almost all reported fever and/or respiratory illness in the 3 to 10 days before limb weakness. In almost all patients, an upper limb was involved. In about half, only an upper limb was involved. The CDC has tested 125 spinal cord fluid, respiratory, and stool specimens from 71 of 80 confirmed AFM cases. Of the respiratory and stool specimens tested, about half were positive for enterovirus (EV) or rhinovirus, including EV-A71 and EV- D68. The spinal cord fluid was positive in two cases. One had evidence of EV-A71 and one had evidence of EV-D68. Still, it's too early to pin the cause on one of these viruses. The CDC has increased its network of neurologists to assist with and confirm AFM cases. The agency has also established a task force of experts in multiple disciplines to develop a comprehensive research agenda to further understand why AFM affects some children and what triggers it. The CDC continues to report updated case counts every Monday afternoon on their website. and has developed a toolkit for healthcare professionals that includes information about AFM and instructions for reporting patients under investigation to the health department.